Dog behaviour counselling Weymouth & Sherborne, Dorset. Yeovil & Somerset. Dogs can exhibit many different behavioural issues and it is important to realise that ‘training’ is never a solution to a problem which is behavioural in nature. For example, many people call me to book on to a training class because their dog is showing signs of aggression towards other dogs and they believe a training class will resolve this simply through socialisation. However, if you do not know how to socialise your dog properly and how to correct the aggression then a class situation will often make the dog worse instead of better. Similarly, I receive many phone calls from people want a private training session to deal with the fact that their dog is chasing rabbits and squirrels all the time and so recall is becoming almost impossible. Obedience training sessions cannot deal with this type of recall issue. If your dog has never learnt how to come back to you and does not have a recall command then, yes, you will need to train your dog. However, once your dog understands the recall command but is choosing not to obey it (usually because it would rather chase the rabbit or play with your friend’s dog!) then this becomes entirely different and can only be dealt with behaviourally. This is why it is extremely important to understand the difference between ‘training’ issues and ‘behavioural’ issues when working with your dog. If you want to teach your dog to sit, wait, lie down and walk to heel on command then you are looking for a training class or a private training session. If you want to stop your dog from repeating any unwanted behaviour patterns then you are looking for a Behaviour Counselling session. Aggression – towards other dogs / people / other animals. Possessiveness – over food, toys, bed, a particular person, etc. Excessive Greeting – i.e. 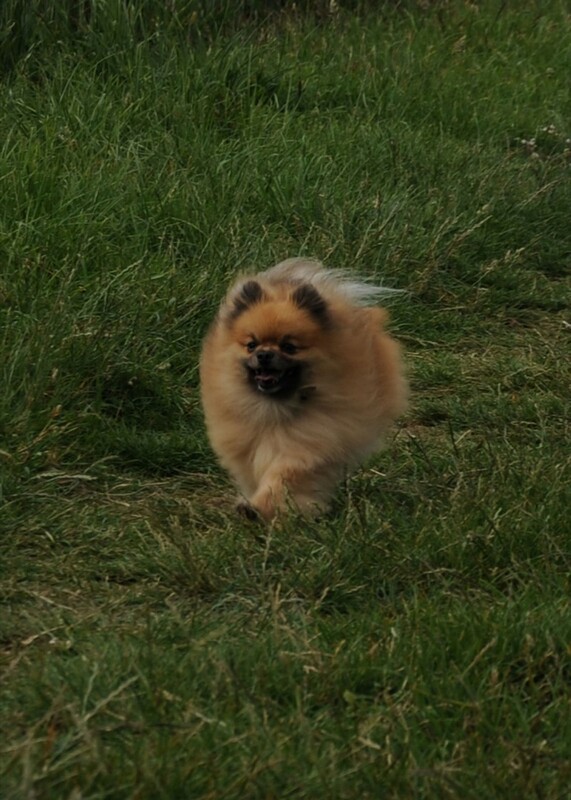 : barking or jumping up at yourself, visitors or people you meet on walks. Hyperactivity – i.e. : pacing, constant playing, constant attention-seeking, difficulty in settling down etc. Stress / Insecurity – i.e. : following you or another family member constantly, destructive behaviour when left, barking or howling when left, toileting in the house (for dogs over 5 months old this is unlikely to be a house-training issue), constant licking or chewing of their own feet or legs, whining, shaking, hiding. Toileting in the house (excluding young puppies) – scent-marking, urinating or defecating in the house are normally signs of stress, anxiety or dominance. Phobias – examples include: walking near traffic, loud noises (thunder / fireworks etc. ), men with hats, people with walking sticks, traveling in cars. Obsessions – examples include: tail chasing, balls or toys, stones or sticks, Hoover, lawn-mower, brooms, mops, household sprays, shadows or reflections. Recall issues – i.e. : chasing prey animals (rabbits etc), chasing cyclists, rushing up to other dogs (either to play or fight), scenting, hunting, stubborn refusal to recall from playing or any other distraction. NB: these issues will not be resolved through Obedience training as they are related to Leadership and/or blocking the hunt drive. The above is by no means an exhaustive list and there are many other behavioural issues which your dog may be exhibiting and which can also be resolved. However, in my experience those listed are the most common problems and most of the dogs I see have one or more of these issues. Often, people believe that their dog cannot be cured and that the problems they are experiencing are simply their dog’s ‘personality’. Frankly, this is nonsense! Dogs exhibit behavioural problems for many reasons, but usually lack of leadership or lack of knowledge (or a combination of the two) is at the heart of all these issues and therefore every problem can be resolved if you know how. That’s where I come in. Whether you have owned dogs for many years or this is your first dog ever, I can provide the right service for you and give you a better relationship with your dog than you ever thought possible. 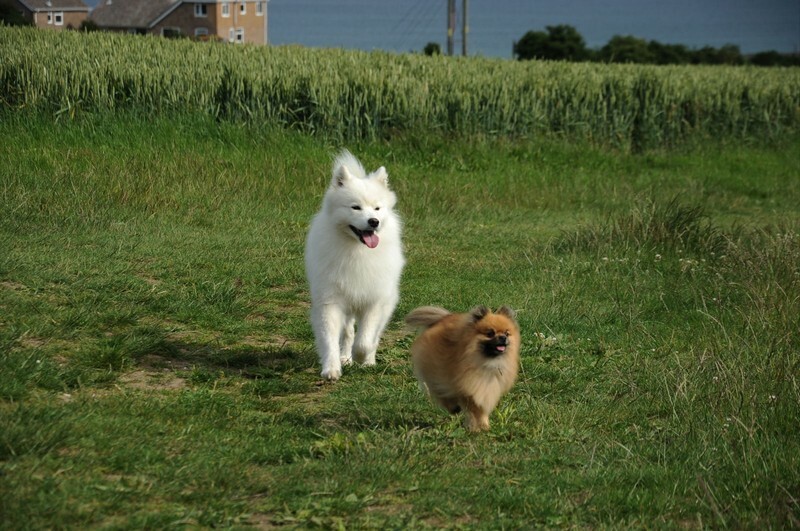 Once you have learnt how to be a good Pack Leader and how to implement the right behavioural techniques you will be surprised how quickly you are able to resolve your dog’s problems. Even if you have seen other dog trainers or behaviourists in the past and nothing seems to work I firmly believe I can still help you. But remember, my job is to teach you how to work consistently with your dog to overcome all your issues over time, not to magically transform your dog overnight (although, with my methods, this can sometimes happen!). So if you love your dog and are committed to giving him/her a more balanced contented life then call me now on 07769 705807 and make an appointment for a Canine Behaviour Counselling session. Sessions take place in your home, including a dog walk where required. The session will last approximately 2-3 hours and cost just £160 (travel fees apply if you over over 20 miles away). You will need to take notes at this session as there is a lot of new information to remember and to practise. You will receive free training & behavioural advice over the phone and by email for the life of your dog. Follow ups will always be available to you if you need them, charged at our standard rate of £40 per hour. Sessions take place in your home, including a dog walk where required. The session will last approximately 2-3 hours and cost just £180 (travel fees apply if you over over 20 miles away). For this you will receive your home visit plus your written behaviour modification plan (your blueprint for change) which is specific to your situation and issues. You will also receive free training & behavioural advice over the phone and by email for the life of your dog, and any follow-up visits can be booked at a heavily discounted rate for a whole year from the date of your initial consultation – £15 per hour for the first 6 months, £25 per hour for the rest of the year. *A nominal mileage charge will apply to appointments over 20 miles away from Corscombe, Dorset. If you live 50 miles away or more from Corscombe (Dorset) then you may be eligible for a Skype session for both dog training and/or pet behaviour counselling. I can talk you through all aspects of puppy training, basic obedience training and many pet behaviour problems, with visual demonstrations and individual programmes to deal with your specific needs. Help-sheets and behaviour modification plans can be e-mailed and follow-up appointments booked for future sessions, if required. Skype Training sessions are charged at £30 per hour. Skype Behaviour sessions are charged at £95 for dogs and £75 for cats and parrots. Please phone or e-mail me to discuss your requirements and to book a session. These days you can rarely turn on the television without seeing an episode of “The Dog Whisperer”, “Dog Borstal”, “The Dog Listener” or “It’s Me or the Dog”. Pop down to your local bookstore and the choice of dog training manuals is even more extensive. However, all these programmes and books seem to be telling us different things, which means that most of the dog owners I meet are getting very confused about how it all relates to their specific problem. So, to give everyone a helping hand I decided it was important to let you know how my own methods work and the type of techniques I use when re-conditioning behaviour or training new commands. These days, there are countless different options available to dog trainers and behaviourists, and most professionals in this field will have chosen the option that they believe to be the best for them. Personally, I prefer to have all the options to choose from, so that I can determine the best techniques and methods for each individual case. Some owners prefer to use reward-based techniques only, which means motivating the ‘right’ behaviour through the use of treats, toys, praise and fuss etc., and redirecting the ‘wrong’ behaviour into something more positive which can then be rewarded. These methods are often extremely effective and in my training classes I predominantly use reward-based techniques as I find they are the best way to teach general obedience work like Sit, Down, Stay etc. If that is your preference, then I can also use reward-based techniques to resolve behavioural issues and more complex areas of training. However, personally I do find that restricting my work to only using rewards can be very limiting as it is not a very natural way for animals to learn and understand. Dogs in the wild have to learn many lessons as they grow up in order to simply survive. They don’t learn these lessons by getting a treat or having a ball thrown when they get it right! Instead, they are corrected at the appropriate times, generally through the use of a well-timed harsh bark or, if that isn’t enough, a small nip. Domesticated dogs do this in exactly the same way. I see dogs exhibit this form of corrective behaviour with each other all the time. For example: when a young, over-exuberant puppy leaps onto an older dog who is frankly ‘past it’ in terms of wanting to play like this then the puppy will get barked at. If the pup persists then the bark will become a snarl, and if that doesn’t do the trick then the snarl will become a snap. 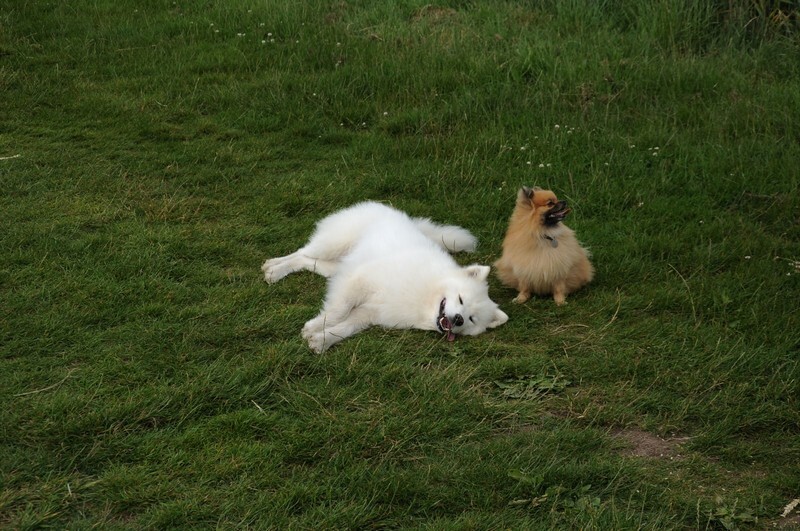 This is not aggression or a vicious attack – it is simply the older dog telling the puppy to “leave me alone”. The pup will not have been hurt or injured, it will not have been traumatized, it will simply understand that this particular dog doesn’t want to play and go off happily to find a more like-minded pooch to have fun with. This natural, corrective way of learning also has its place when we want to recondition unbalanced behaviours – providing the correction is done at the right time and in the right way. The dictionary definition of ‘punish’ is: “cause to suffer for offence”. The definition of ‘correct’ is: “set right; indicate errors”. When working with dogs, there is no need to make them suffer in order to teach them to stop doing a particular unwanted behaviour. We can simply correct instead, so that they learn instantly that they have done something which is considered ‘wrong’ in a human society. For example: children are commonly punished by having a favourite toy taken away or by being sent to their room. But this will only work because the child understands why they are being punished. Clearly you cannot explain to your dog that you have taken away his favourite ball because he has chewed up your shoes. The dog will not be able to connect the two actions and the ‘punishment’ will have achieved nothing. On the other hand, if you give a firm “No” command whilst the dog is chewing your shoes then this may startle him enough to stop. This is one example of a corrective technique – the dog will not understand the word ‘no’ without consistent repetition, but he will connect the harsh correction of being startled with whatever he was doing at the exact moment he received the correction. Critics of corrective methods argue that such techniques are simply a ‘quick fix’ or a ‘lazy’ solution to a problem which could also be resolved through long term reconditioning using reward-only methods. I find this reasoning quite odd as I cannot understand what is ‘bad’ about resolving a problem quickly. In my professional opinion it is in the best interests of both the dog and owner to provide the quickest possible way to balance the animal and prevent unwanted behaviours, whilst ensuring that the dog remains physically and psychologically sound throughout the reconditioning process. Any corrective methods recommended in my work will not harm or traumatize the dog in any way – this would be vastly opposed to my moral values as well as my professional ethics. Corrective methods to recondition behaviours such as hunting, aggression, straying, and many others, can take various different forms – but they should only ever be used with proper guidance and training from a professional. Any techniques shown on the television should not be attempted without first consulting an expert otherwise they could lead to your dog becoming fearful and even more unbalanced than he was before. If you decide to come to me for help with any area of your pet’s behaviour I will always recommend the methods which, based on my vast experience, I believe to be the most suitable for both you and your pet. I can use reward-only methods if you prefer and I can teach appropriate corrective methods; but most commonly I will recommend a combination of the two. It is also vital to understand that whichever methods you decide to use, training and reconditioning of any animal can only be achieved through calm leadership, consistency and commitment. Rewards given at the wrong time or just ‘to be nice’ will do no good at all and corrections given in anger, stress or frustration will be equally ineffective. Improper use of any techniques, reward-based or corrective, can be detrimental to your dog, so it is always essential that you learn to communicate effectively with your dog by understanding the methods you are using and how to apply them. This is the most common form of control for taking your dog into public areas. 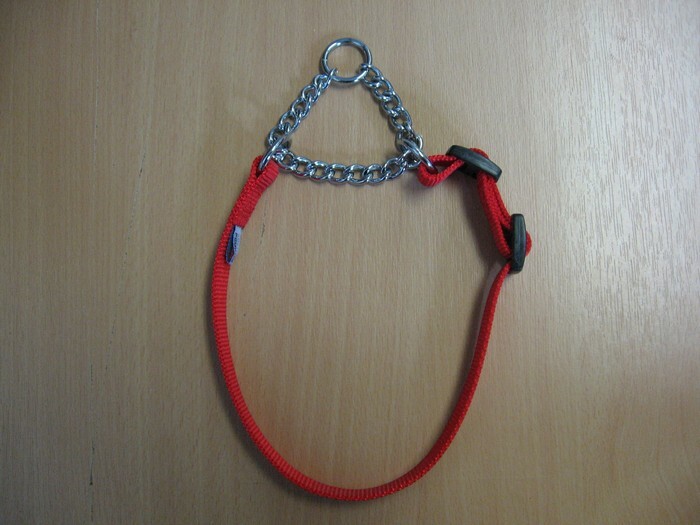 The collar goes around the dog’s neck and the lead clips onto it with the other end held in your hand.This ensures that you can keep your dog from wandering around, getting hurt or getting into mischief.For training such as walking to heel and not pulling, it can be used with both reward-based training methods and corrective ones but for both methods you will need to learn how to do this properly by getting professional advice. 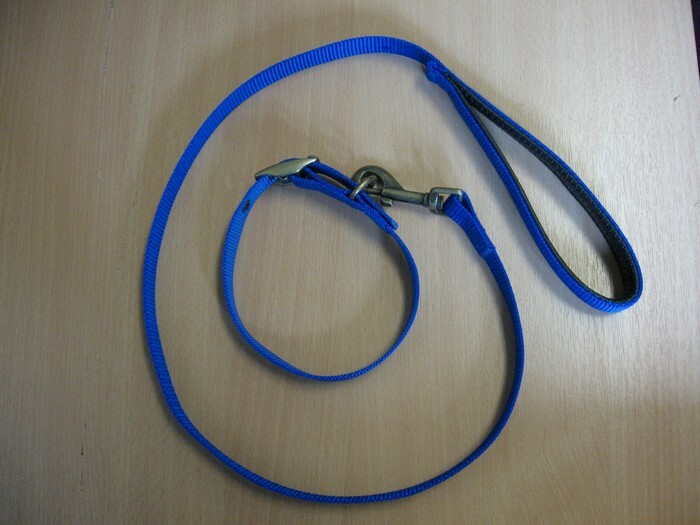 These are like ordinary collars but with a short length of looped chain which tightens when pulled. The half-check collar is useful in giving dogs a quick correction as the chain also makes a snapping noise when the dog is ‘checked’.To gain maximum benefit from using this type of collar it is important to know how to use it properly by consulting an experienced trainer. If used incorrectly it will have little or no effect, or worse, could end up hurting the dog if it is fitted too tightly. These are just a few of the names given to a simple length of rope or nylon which is looped over the dog’s neck with no need for a collar. As these leads will tighten when pulled by either you or the dog it is essential that you know how to use a lead like this correctly before putting one on your dog.I would also not recommend the use of this type of lead for young puppies.If you are unsure please pop down to the Pet Education Centre with your dog and we can make sure he is developed enough to use one. 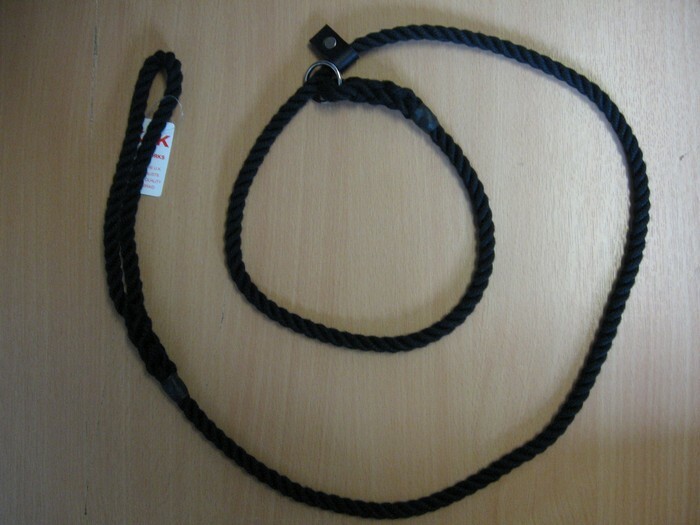 These leads should always be placed high up on a dog’s name for maximum control but they can also be used to great effect in a figure-of-eight loop around the dog’s muzzle and then around the top of the neck. Again, always make sure you know how to do this properly and feel free to ask us if you are not sure. Most dogs are greatly motivated by food but some are fussier than others. When using food as a reward it is best to find something that your dog really likes. 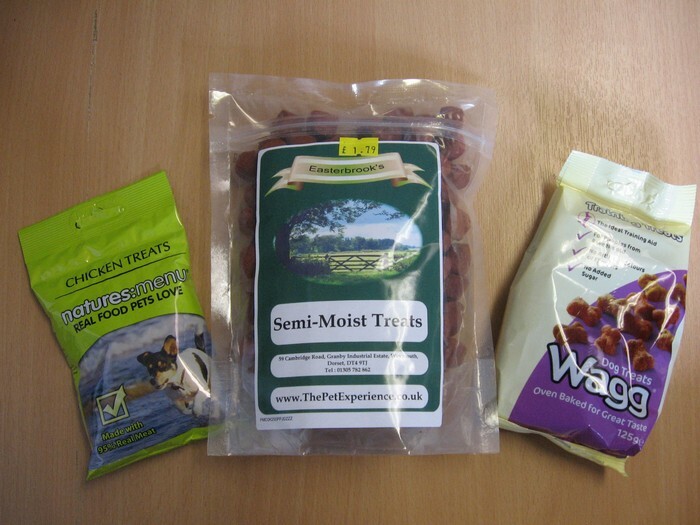 Good examples would be cheese, liver, sausage, chicken and many specially training treats from your local pet shop. However, be careful not to over-reward and make sure the treats you use are very small. I.e. you should not be giving a whole sausage as a training treat or you will end up with a very overweight, unhealthy animal! Instead, cut the sausage up into tiny, fingernail sized pieces and you will have a healthier dog and a better bank balance! Correct timing of rewards is essential too, so when using treats make sure you know how to train properly by attending training classes or having a private training session in your own home with a qualified and experienced professional. If you have a dog who prefers toys to food, or who simply isn’t motivated by food at all, then it can be just as effective to use a favourite toy or ball as a reward during training. Again, correct timing is essential but at least you won’t have to worry about the dog putting weight on! The only disadvantage to using a toy as a training reward is that play often leads to over-excitement, which can cause problems when you are trying to teach self-control exercises like a Stay, for example. 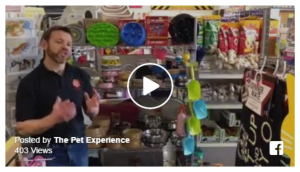 So, if you feel your dog is only motivated by toys then learn how to use them to your best advantage by seeking advice from an experienced trainer. Many dog trainers swear by clicker training and it is certainly an extremely effective method of teaching obedience work, tricks, and shaping new behaviours. This is due to the association of a distinctive noise with a particular behaviour, followed by a reward. 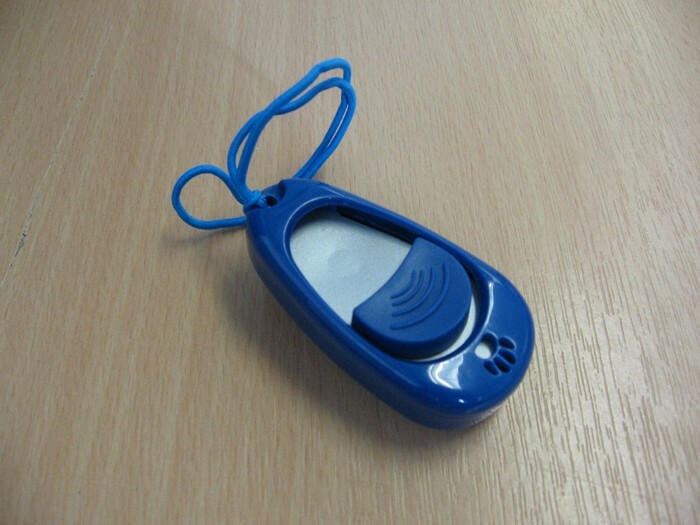 However, the timing of the click is imperative and many owners do find them difficult to use. Clickers need to be used in conjunction with treats or toys so some handlers find them too ‘fiddly’ as they try to use a lead, clicker and treat at the same time! In experienced hands, clickers are a very intelligent method of training but you will need to seek professional guidance to learn how to use one effectively. I am happy to teach clicker training on a one-to-one basis only as, due to the problems described, I do not feel clicker-training is appropriate in a group setting. All of these tools work on the premise of correction by noise distraction. If people find that a verbal correction is not working for them then another startling noise can be very effective. 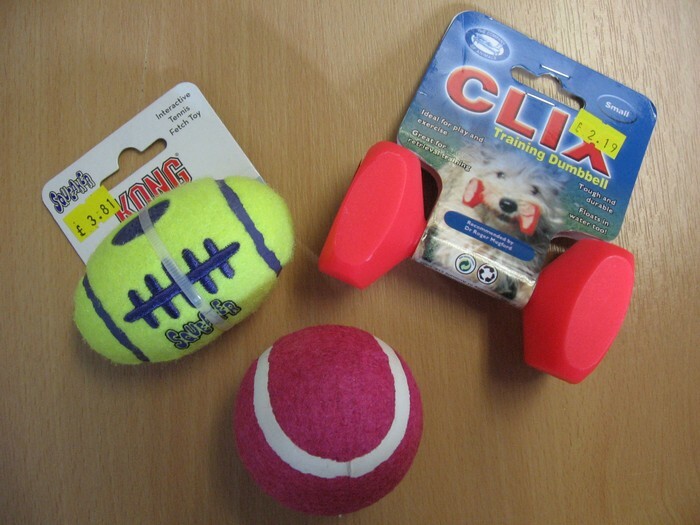 These tools should be used with care as nervous dogs can easily become very scared by unusual sounds. Also, more confident dogs may quickly adjust to the noise and learn not to be bothered by it at all. 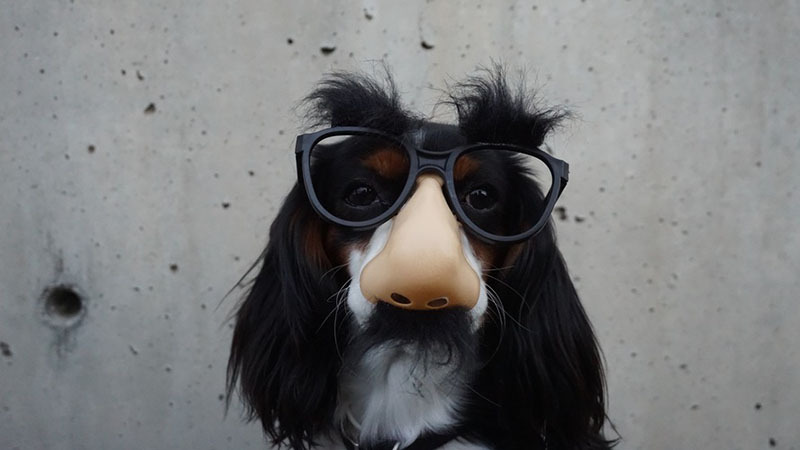 The main downfall of these tools from a practical standpoint is that generally the dog becomes conditioned only to the particular noise corrector you are using – which means you will forever have to carry it with you wherever you go! 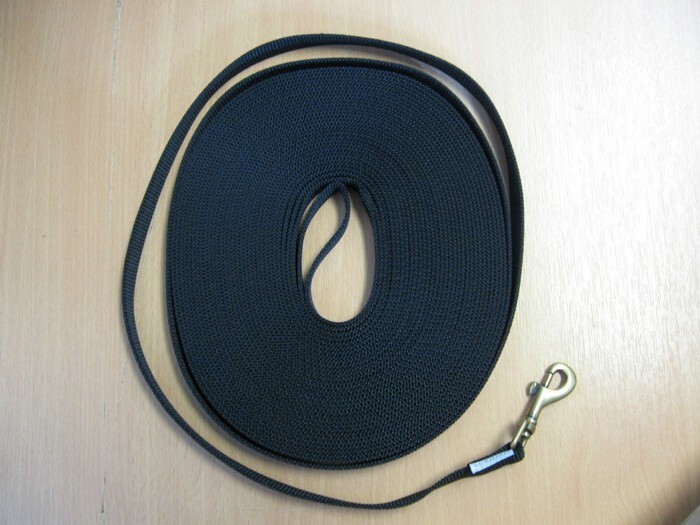 A training line is a long length of rope or a specially made very long lead. Store-bought lines are normally between 15 and 50 feet long but home-made lines can be any length and are often made much longer to allow more freedom to run. Training lines can be extremely effective if the handler is taught how to use them correctly but they can be troublesome and impractical at times. It is easy for dogs (and people) to become tangled in them and if you have a large dog who can run fast then you could get pulled off your feet quite easily or have the line slip out of reach, rendering it next to useless. I would therefore recommend training lines mostly for small to medium sized dogs or for very nervous dogs where other tools may not be appropriate. There are many different types of spray collars on the market these days. 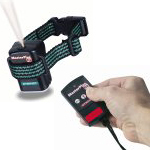 Some are marketed specifically as anti-bark collars and these will spray automatically when the dog barks to act as a correction and deterrent. Others are operated by remote control which means that you are in control of when the spray correction is given. The spray can take the form of plain water, citronella scent or mustard scent. Obviously, the scented forms can be especially helpful in blocking hunting or tracking dogs as it will help them to lose the scent that they have fixated on following. Spray collars can be an extremely powerful form of reconditioning for the majority of dogs but timing and correct usage is essential. Also, not all dogs will respond to the collar – some may actually enjoy it and some may be too timid for the use of this tool to be appropriate. 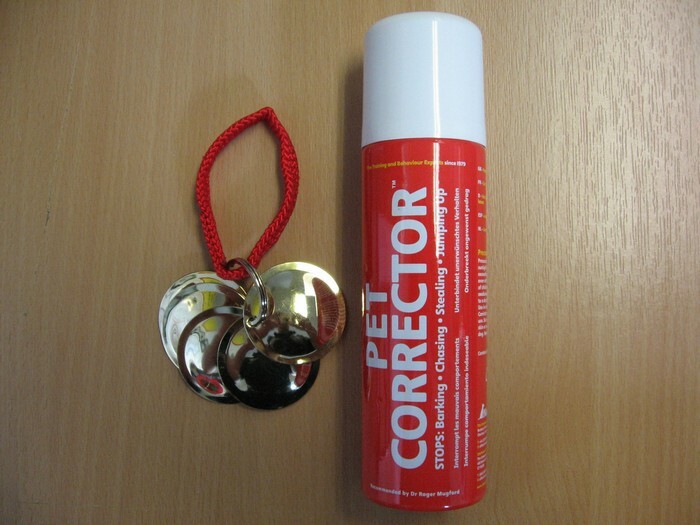 If you are thinking about purchasing or hiring a spray collar it is imperative that you seek professional advice and training so that you can decide whether it will be appropriate for your dog and so that you know exactly how to use it correctly. As with the spray collars, these come in two main forms – the automatic ‘invisible fence’ collar and the remote control collar. E-collars have become the focus of much media attention in recent times but whatever your view of these tools, I can only offer my own opinion based on my personal knowledge and experience. The collars use a safe current of electricity designed to startle the dog in exactly the same way as a spray collar or noise corrector. The sensation given has been likened to the sensation provided by an ordinary ‘tens machine’ used on people to help with muscular conditions. I have personally felt the shock given by one of these collars and would liken it to the type of static ‘shock’ we often get from car doors etc. The shock does make the dog jump and sometimes dogs may yelp as well, but I have never seen a dog appear to be in any pain or show any sign of being traumatized by the shock. When I get a static shock from a car door I often yelp too, but out of surprise rather than pain and it doesn’t take me more than a second to recover. The same is true of dogs and E-collars. These collars are used in a small minority of cases (in my own experience, less than 1% of clients – based on working with over 1400 dogs in the last 3 years) when other methods of reconditioning are deemed unsuitable or shown to have no effect. The ‘invisible fence’ collars are used to prevent straying. For example, former clients of mine have more than 20 acres of land which is their ‘garden’ and it is impossible to fence in the usual way due to legal building restrictions on the land. They want their dogs to be able to run free in their garden without the risk of them straying and running across any of the nearby roads and so they felt that an invisible fence was the best option to give their dogs the best possible lifestyle whilst ensuring their safety. 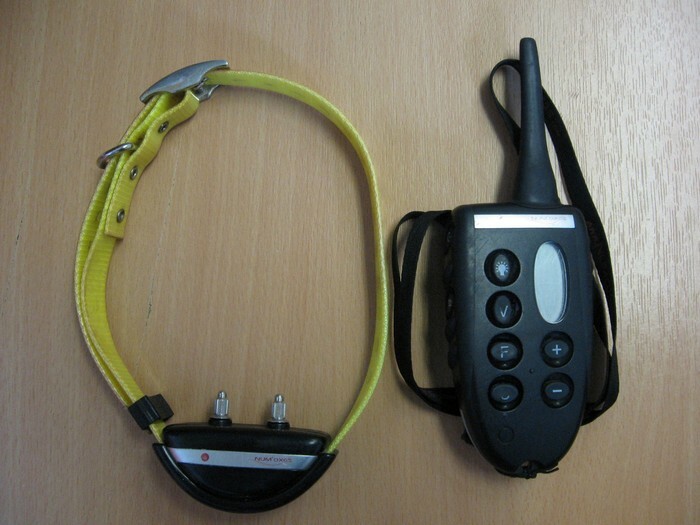 Because these collars give a warning ‘beep’ when the dog moves near to the boundary most users find that the dog only actually needs to get corrected once or twice before learning to stop as soon as the beep is heard. In time, most users find that the dog learns exactly where the boundaries are and they don’t even need to wear the collar anymore. The remote control collars work in exactly the same way as described in the previous section for the remote control spray collar, except instead of a short burst of water they give a short shock. By ‘short’ in this context I am talking about a length of time which, on a standard E-collar, is approximately one fortieth of a second. As stated earlier, corrective techniques with dogs need to be done in the moment – in the split-second when the unwanted behaviour occurs, so this short shock will be enough to startle the dog, stop the behaviour and regain the dog’s attention. Both spray-collars and E-collars can be used either to condition a response to a certain trigger word (thereby removing the need for the collar) or to condition automatic avoidance of a certain animal, object, place or behaviour. E-collars should only be used with professional training to ensure that the handler learns how to use them properly and safely. If E-collars are used wrongly then they can have a severe negative impact on your dog and ruin the bond you have built up with your pet. However, when used for the right reasons, in the right way and by a trained handler they can (and do) save lives, prevent injury and help both you and your dog to lead a happier life together.